A Shepherd University senior, graduating in December 2015 with a BS degree in COMM/NEW MEDIA (with a concentration in Media Studies) & a minor in Art. I am easily remembered by my country accent. I'm a WV native. Besides keeping busy with college work, I enjoy riding horses, drinking coffee, and binge-watching on Netflix. Senior Capstone. Two of the most exciting, yet scary, words that can slip out of your mouth. Why? Well, of course you know you’ re so excited to complete your final project in the Shepherd University Department of Communication. However, it’s a little scary and overwhelming because lots of time, hard work, and patience goes into this project that leaves your lasting impression as you walk out into the real world. Capstone for me was a lot of fun–as Professor Monica Larson said it would be, at least she said so to the class, as long as we managed our time and projects in a well-mannered way–and of course choosing a project of which we are passionate about. During my adventure here at Shepherd University, I dabbled a good bit in the Digital Filmmaking side of the COMM Department. Therefore, I decided to channel what I had learned in those particular courses and bring them forth in my Capstone Project. With a new studio lighting kit (a Christmas gift of mine– Thanks Mom! ), I was ready to set up and create a film trailer. My Church in my cozy hometown of Upper Tract, WV has been discussing the rapture and the coming of the Lord. A lot times, people in movies try to make this scary–but if you’re ready for it, it’s the complete opposite. I wanted to channel these positive feelings into my trailer called Soon. For me, it’s hard to hear others who doubt God’s existence. I mean, look at all the beautiful sights in the world! Again, that was another thing about my trailer that I wanted to make sure was highlighted. I want to open up people’s minds to God, and I know that sometimes the way to do so is to open their hearts first. I’m truly blessed to have an awesome church family. 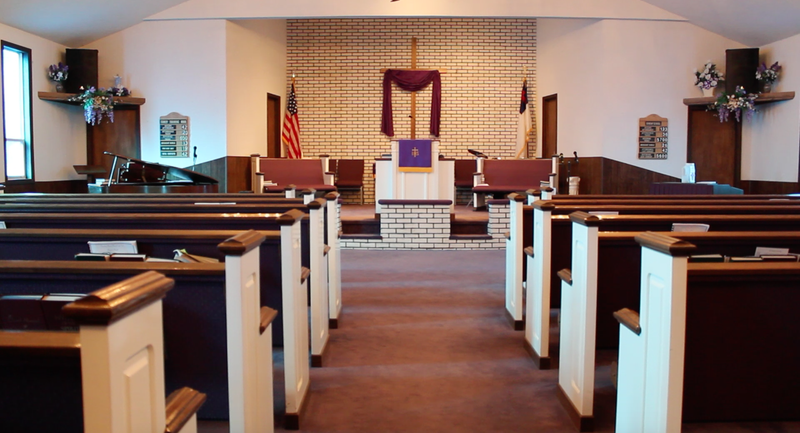 They allowed me to spend several hours gathering the right footage in the church scenes in the trailer. So many thanks are in order to them, as well as my cast members. I traveled home (2.5 hours away from Shepherdstown) to gather a large portion of the footage used for the film trailer. 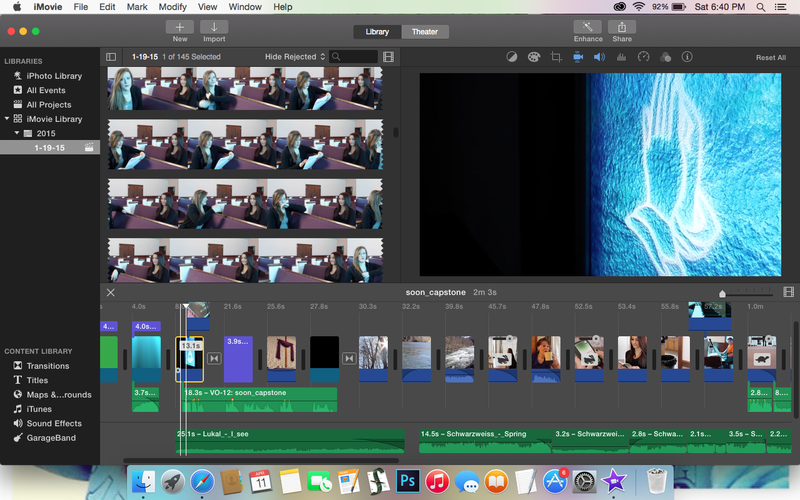 For editing, I started in Adobe Premiere, but ended up more comfortable in iMovie. I struggle somewhat with audio, it’s the least thing I have practiced in the COMM Department, so I was back and forth between voiceovers and editing audio on WavePad. 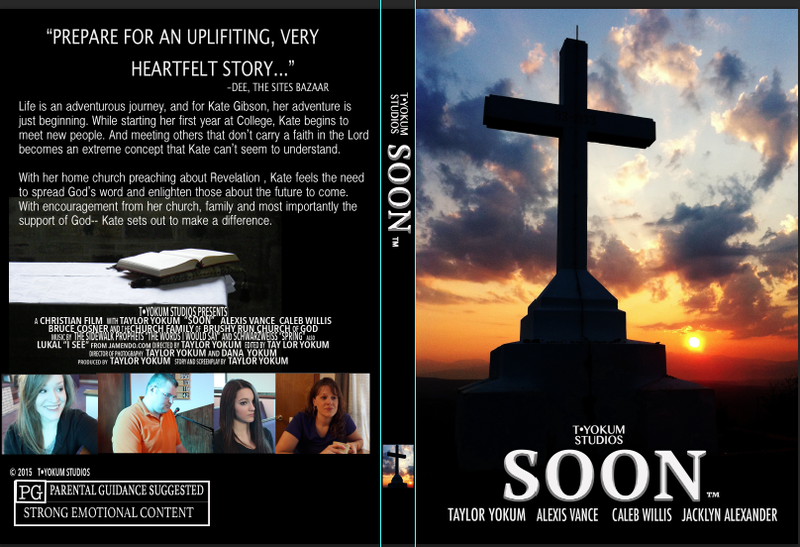 Nonetheless, I’m truly satisfied and happy about my project. I got a lot of positive responses which really made me feel that I had accomplished what I set out to do. I know my awesome God is proud. In closing– I can’t even begin to express all of my gratitude to the COMM Department and all of the amazing faculty members. I’ve learned so much during my time here and I feel so prepared for what is to come next. Capstone was A LOT of hard work, but it was incredibly worth it. If you’re really interested in studio production or working in the world of news, COMM 360 is the course for you! Studio production was a very neat experience. It really prepared me for my current internship at WHAG-News in Hagerstown, MD. Dr. Kevin Williams really created a course full of fun studio knowledge. 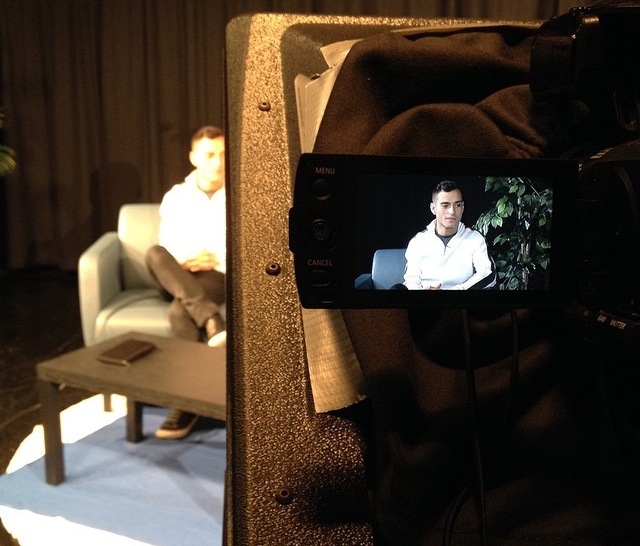 From learning the systems theory, to filming and producing a show–the whole class was a blast! Looking back on it, I’m so happy that I decided to be a part of the class. It truly gave me real world experience. There are so many job positions that Dr. Williams covers and allows you to fulfill. It really helped me to find where my own interests are. I encourage everyone to take this course. I guarantee that there will be some aspect of it that you find exciting–just as I had! From my own standpoint, WHAG-NEWS was impressed of the knowledge I had attained prior to my internship. I have COMM 360 Studio Production to thank for that!! Filming Christopher Rector and his group for a project done in Studio Production. Here I am with Chloe Powers. We are taking the Director & Switcher Seats in the Control Room. COMM 406 Advertising and Imagery is an awesome class! To me, it felt like I wasn’t just sitting in a boring classroom. 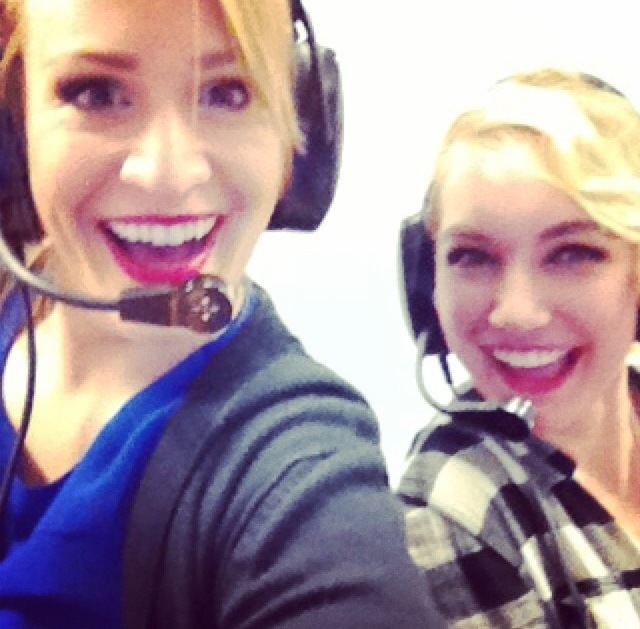 I felt like I was engaging in what life would be like working for an advertising company. Each project was exciting! As students (or in my mind–advertisers), we would be given the information about a certain product (the brand name, the target audience, the goal, and etc.) and then we would create our own campaign for that product. This leaves a lot of creativity to you. It’s a fun challenge to make your ads stand out, meet the criteria, and have a consistent message that makes your campaign…well…YOUR campaign! 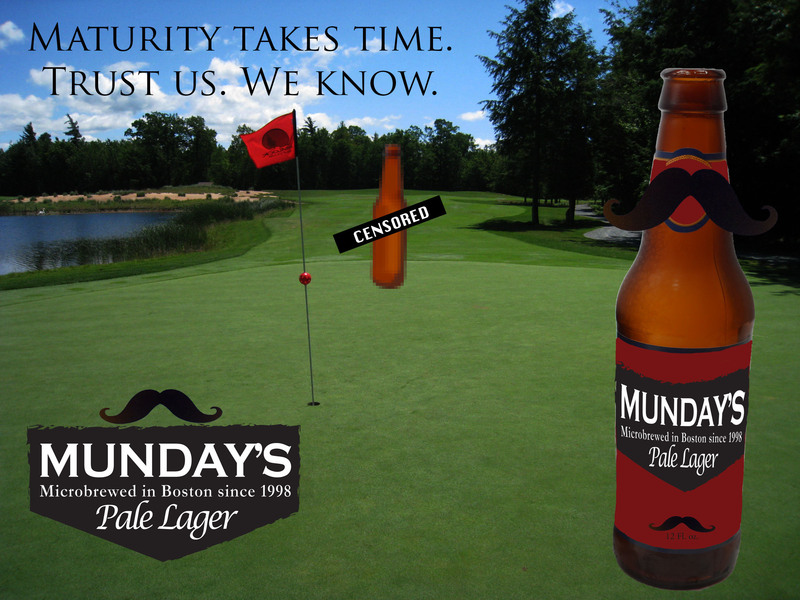 One of my favorite projects was the MUNDAY’S Pale Lager. 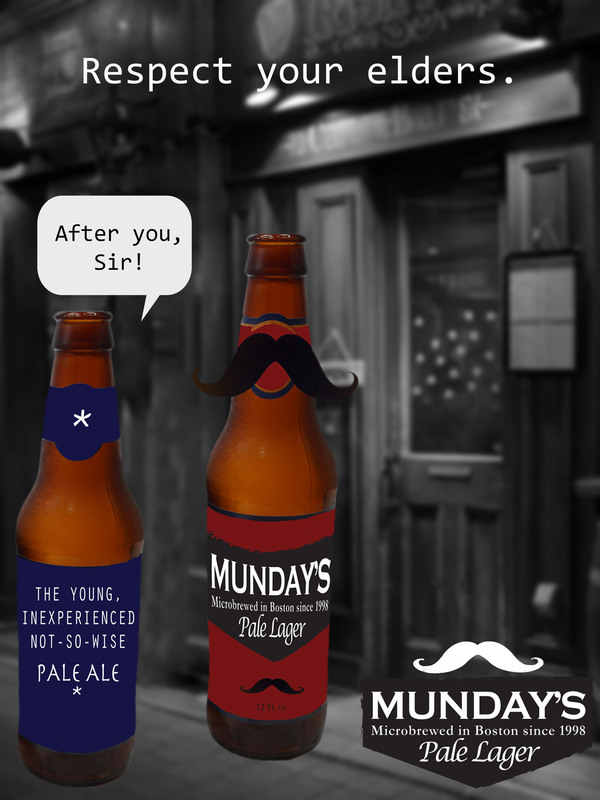 We had to create an ad campaign for the lager that would appeal to 65+ men and women with a household income $100,000. Also– psychographic educated, both liberals and conservatives.